After a few days acclimatizing in and around Cusco, we were ready to start our trek. Above all else, you want to pick a good trekking company, and after some searching we settled on Alpaca Expeditions. They have great reviews on Tripadvisor, and we liked the unique itinerary they offered for Salkantay compared to some of other trekking companies. Your trekking company will give you a duffel bag to put your stuff into. Whatever luggage you brought from home will stay at your hotel or at the offices of your trekking company. You’re limited on what you can take by the size of the duffel so pack smart (see our packing list post for recommendations). It’s important to get a good night’s rest before you start. We had about 3-4 hours. Definitely not enough. Our guide, Christian, picked us up from our hotel at 4am on Tuesday morning. The three hour ride to Soraypampa was quite bumpy, so there wasn’t much hope for catching a nap on the way. After arriving at the departure point, you’re introduced to your horsemen, porters, and cook staff. We caught our first glimpse at Mt. Salkantay, which in Quechua translates to Wild Mountain. After breakfast we set out on our three hour hike to Soyrococha. Mules ready to carry our luggage. 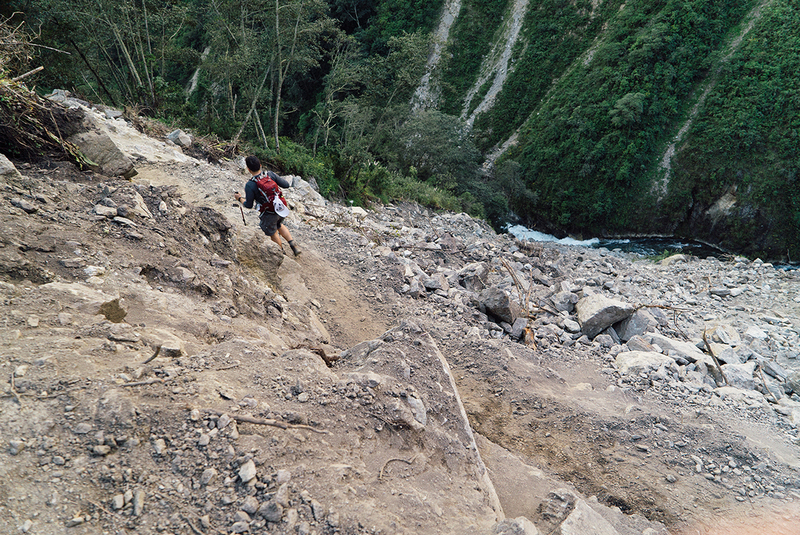 The trail to Salkantay Pass. The landscape that first day was like something out of a movie. 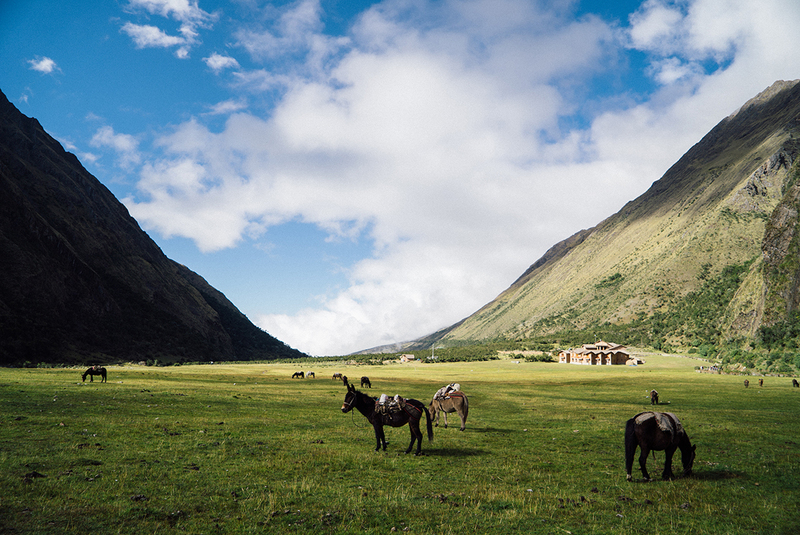 Each member of our six person group kept saying things like, “They could have filmed Lord of the Rings here!” Mules which our guide called, “wild domesticated,” whatever that means, roamed the landscape freely. 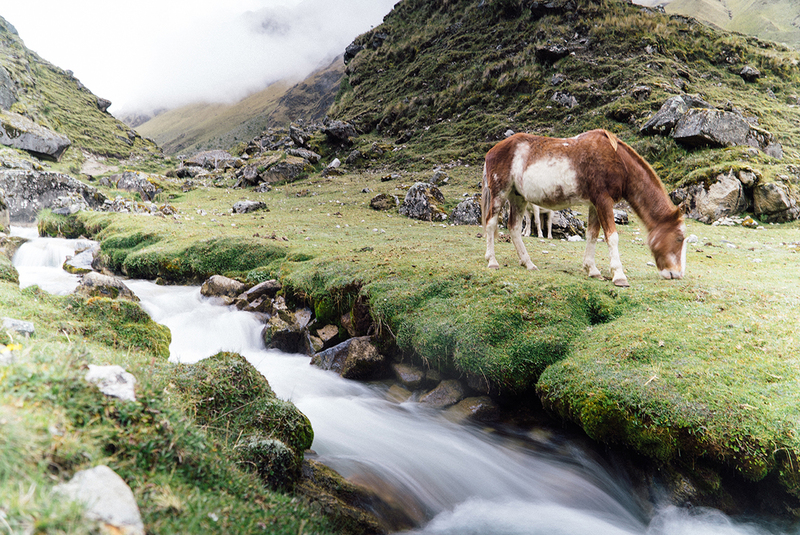 I thought they could not have a better life than this, grazing in a gorgeous valley filled with waterfalls. 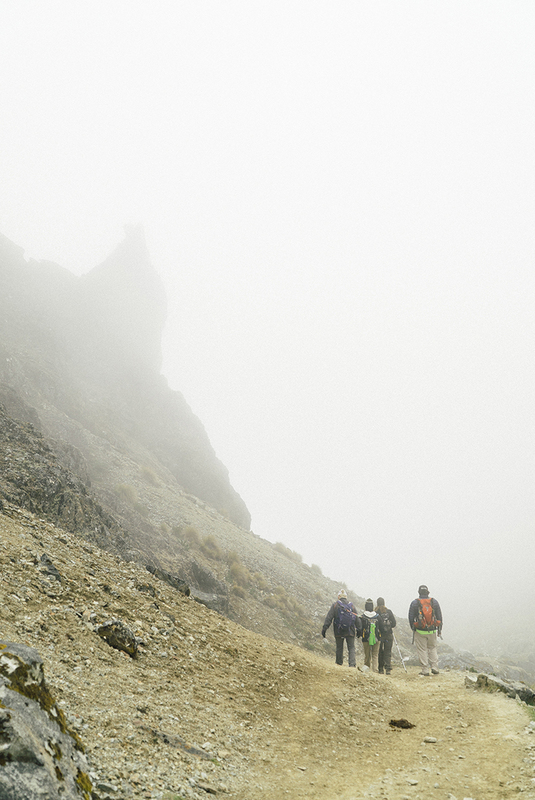 Some of the most stunning terrain you’ll see on the trip happens here. We were very fortunate that we didn’t get rained on the entire trip. This is rare. You should count on it raining on you (Alpaca provides ponchos). 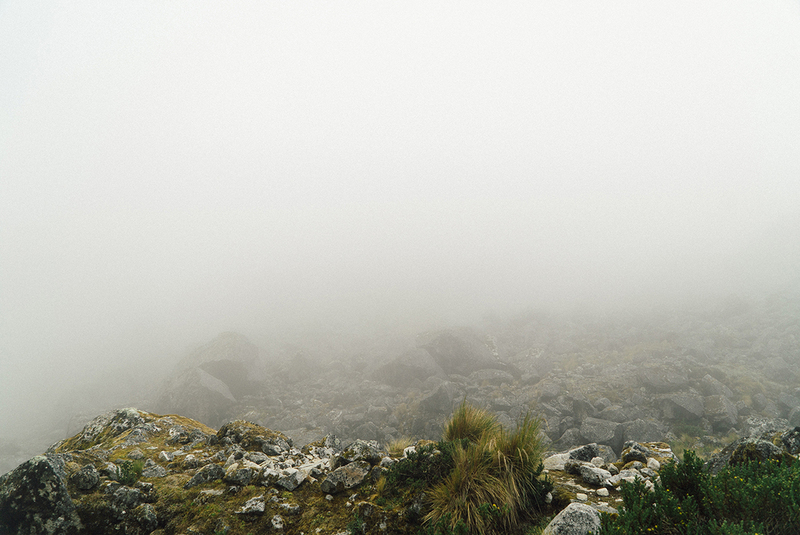 The clouds also parted and offered us a full few of Salkantay peak, which again was apparently a rarity, so much so that our porters stopped and whipped out their cell phones to snag a picture. A rare glimpse of Salkantay Peak. It’s a difficult push uphill to the peak, following rocky watersheds to the pass. At least, we found it difficult, still adjusting to the altitude and not being in the best of shape. After lunch we would ascend to the pass, which sits at 4600 meters (15,091 feet). A member of our group, nauseous and blacking out, had to take a horse to the top. It’s comforting to know that this option is available to you should you need it. 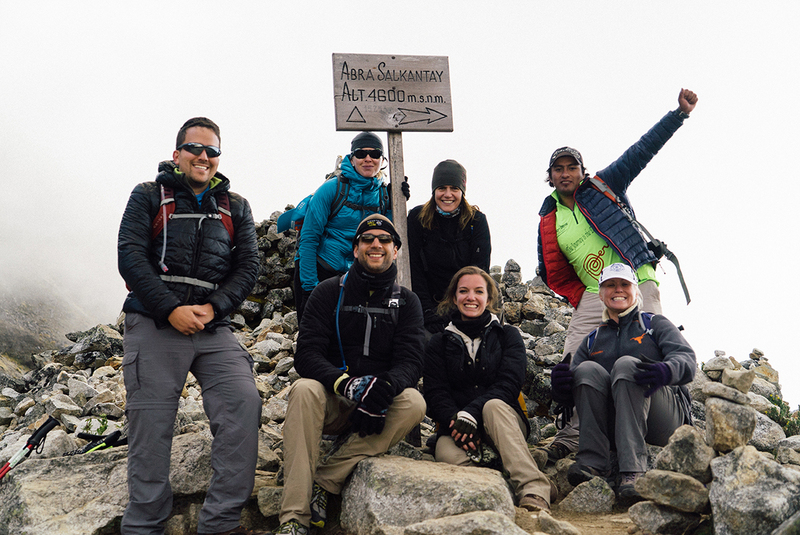 The group at Salkantay Pass, 4630 mt. But reaching the pass is an amazing feeling. You know you’ve conquered the most difficult part of the trek (although I’d also be quick to add it doesn’t necessarily get any easier). You’re above the tree line and the green valleys have given way to rocky boulders. 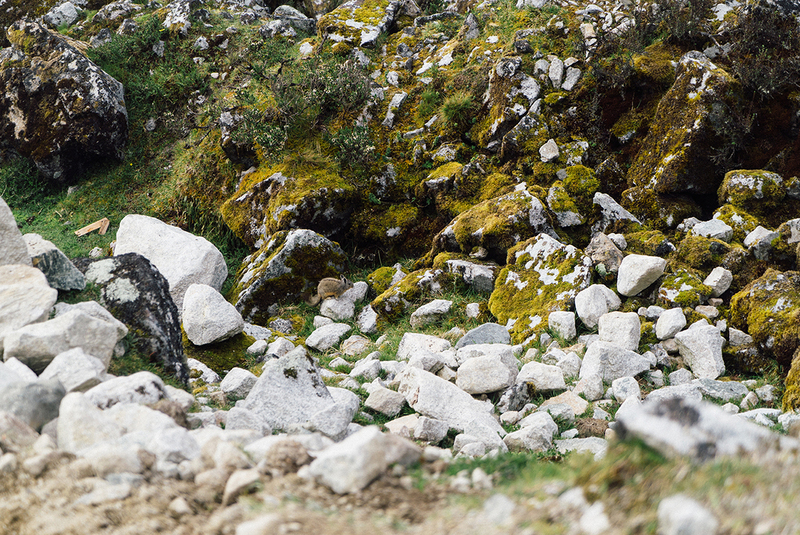 We spotted at least 10 chinchilla hopping around the moss covered rocks. In the distance you could hear the roar of avalanches tumbling down Salkantay. Look close—chinchilla just left of center! Horsemen passing us on the trail. The descent proved to be rather difficult as well. Lots of loose rock means taking it slow, and it begins to take a toll on your knees after awhile. Knee braces are highly recommended if you’ve ever had any kind of knee pain. Darkness crept up on us fast as we were running a bit behind schedule. Make sure you have your headlamp with you just in case. Fortunately we had the lights on our cell phones to illuminate our path a bit, but the last stretch is muddy and difficult to navigate in the dark. Members from the trekking crew who were already at the camp had to come looking for us to guide us in. A potentially scary situation, but we were close enough to the camp so we weren’t too alarmed. 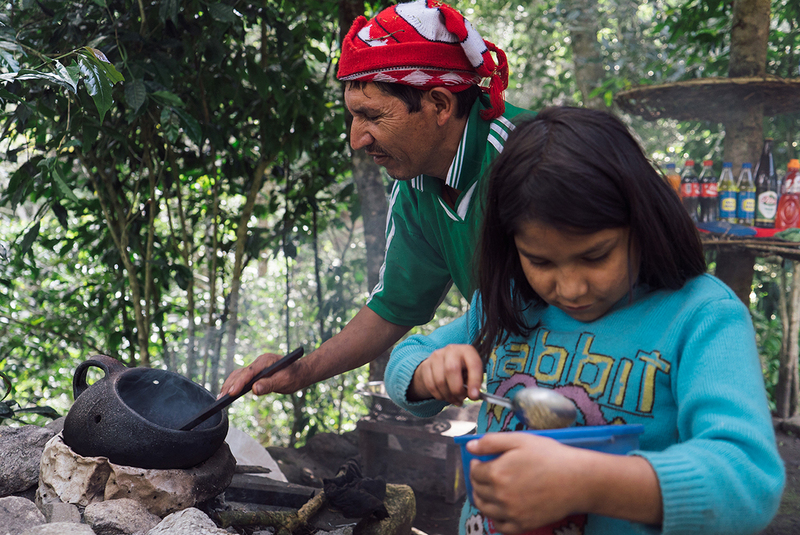 Exhausted and hungry, our camp at Huayramachay was a welcome sight. 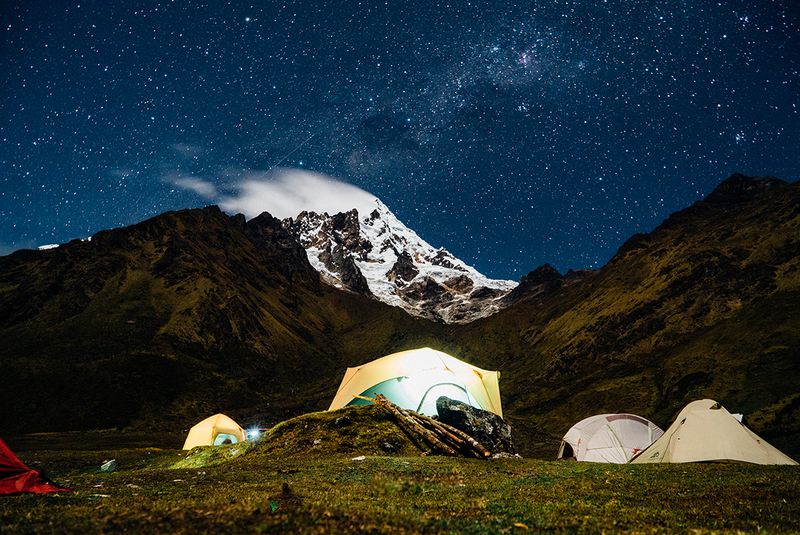 In our opinion this might be the best night of the trek, as your campsite is very remote, and the stars fill the sky—something you don’t see much of when you live in the city. Surrounded by snow-capped peaks, the stillness and peace of the first night quickly erased the weariness of the day. 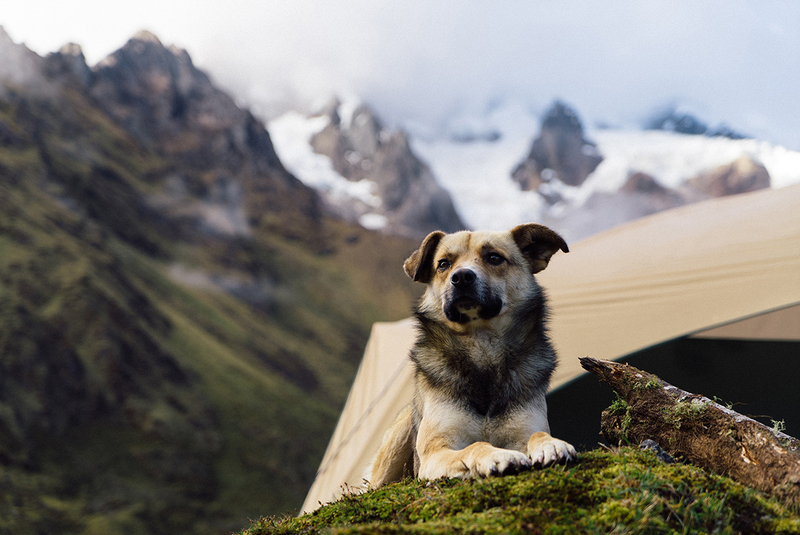 These vigilant mountain dogs kept the camp secure. Huayramachay camp in the morning. We were excited in the morning, knowing the hardest part was behind us, at least as far as altitude was concerned. Every day presented a unique challenge. The roosters woke us before Christian did, and after breakfast we set off downhill toward Colpapampa. 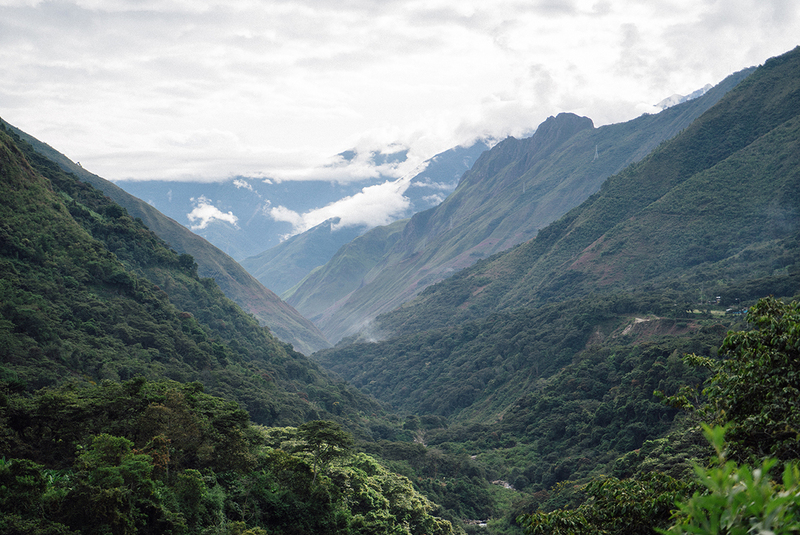 The rocky glacier-carved valley quickly turned to jungle, and we started seeing many varieties of orchids. Setting out on day two. Dozens of orchid varieties on the Salkantay trail. After being in the middle of nowhere, our first sign that we were returning to civilization was a power line far off in the distance. We arrived in a small town for lunch, which was another three course meal that Alpaca is known for. Day two is the longest day of the trek, which is one of its unique challenges, as well as being mostly downhill, which I found challenging because of the loose rock and frequent landslides you cross. After awhile it takes a toll on your knees. That night we camped at the edge of a larger village called La Playa, and were able to enjoy cold beers from a local vendor with our dinner. At this campsite we were given a plastic bag and told to only pack in it what we absolutely needed for the evening of Day 3 and the morning of Day 4. 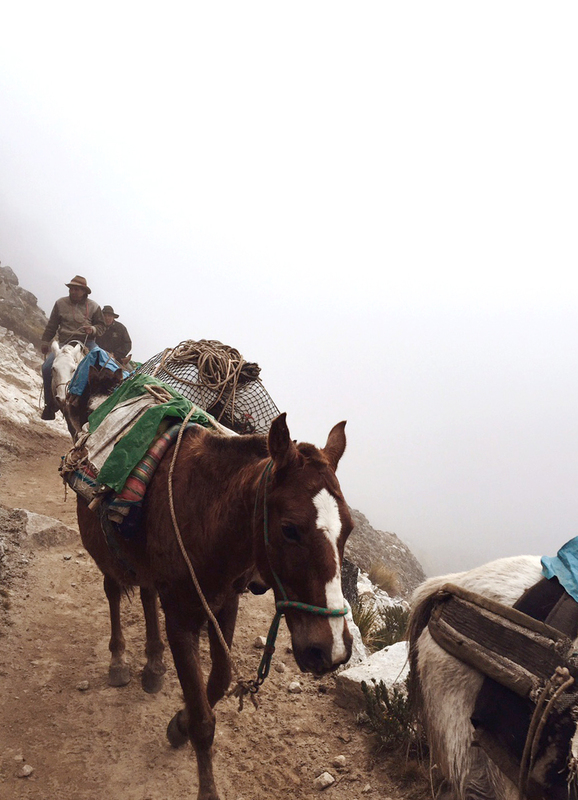 The mules could no longer follow us, and our porters would be carrying our necessities on their backs to the next campsite. Our duffel bags with the rest of our things were taken by a van the long way around, and we wouldn’t see them again until lunch on Day 4. These porters are incredible. They carried all of our things plus tents, sleeping bags and whatever the cook needed. They passed us on the trail that day and always had the camp set up by the time we arrived. Any complaints about the difficulty of the trek sort of fade away when you see them run past you, loaded down with all your stuff. 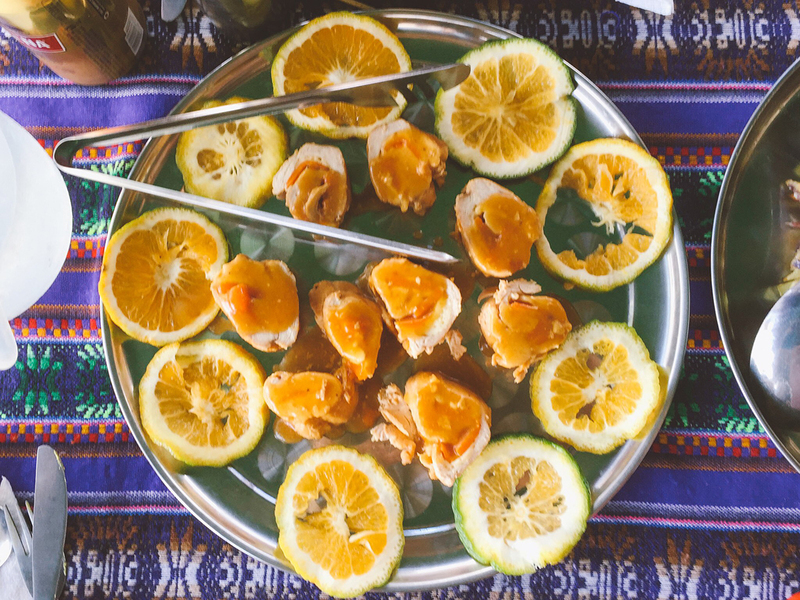 The food on this trek was incredible and there was always more than enough to feed our hungry crew. 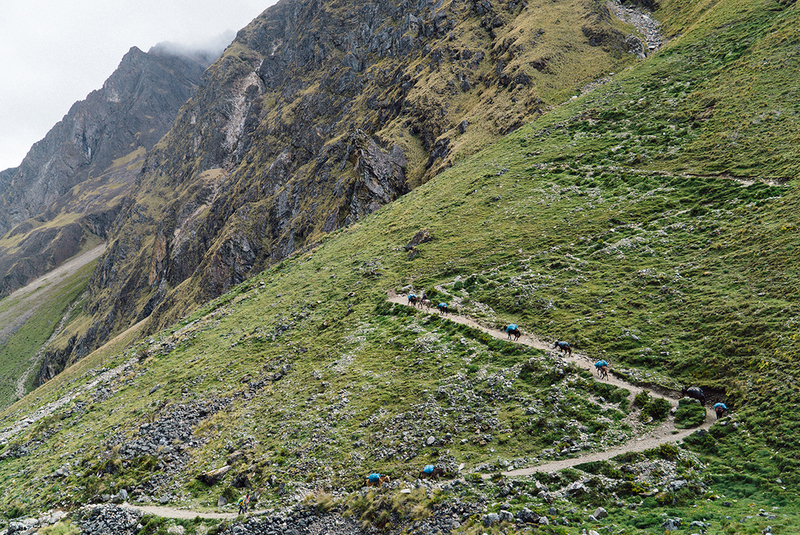 Day three is mostly uphill, on part of the Inca trail network. Heavy breathing ensued again and frequent stops were necessary as we pushed uphill. 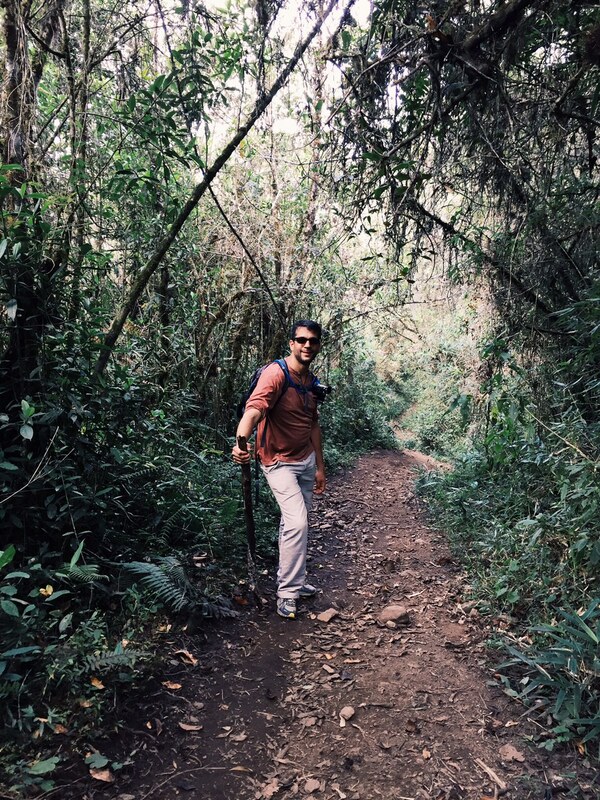 We got to spend Day 3 on an Inka Trail. Our leisurely morning at Starbucks. 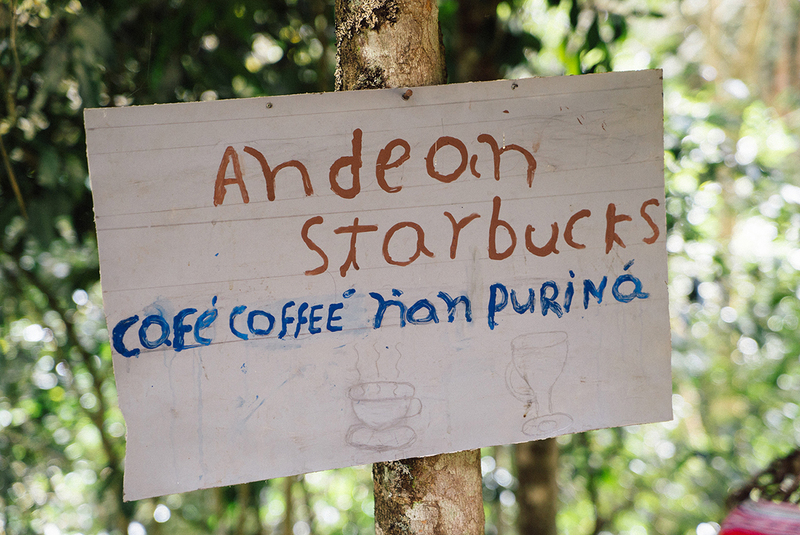 We learned how to pick and shell coffee beans. 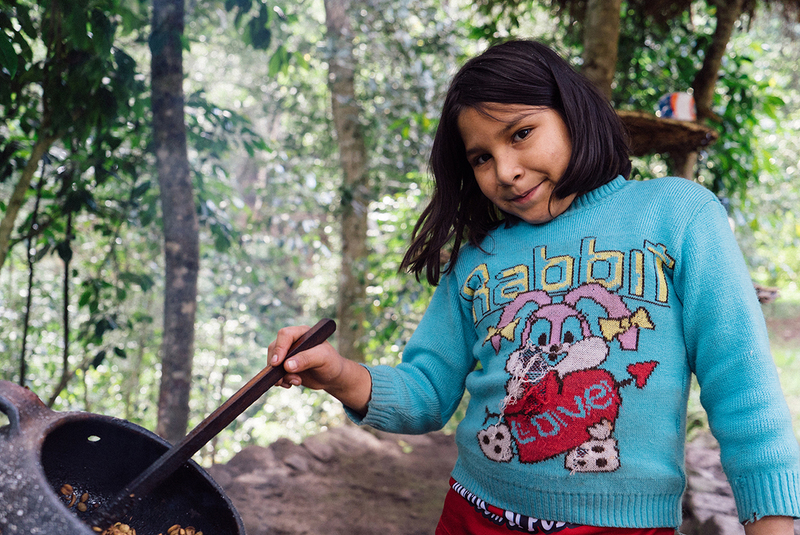 After drying in the sun for four days, the beans are roasted, which was demonstrated to us by the farmer’s nine year old daughter, Junildina. She goes to school in La Playa, the town we had come from, which is quite a trek to make every day, but today she was off due to a school holiday. After cooling, we ground the beans and shared a wonderful pot of coffee. Junildina showed us her artwork and passed out Bratz stickers, since we all independently gave her small piles of cash and snacks to thank her for the coffee. A mini entrepreneur, she said she was going to use the money to buy candy to sell to the other kids at school. Smart girl! 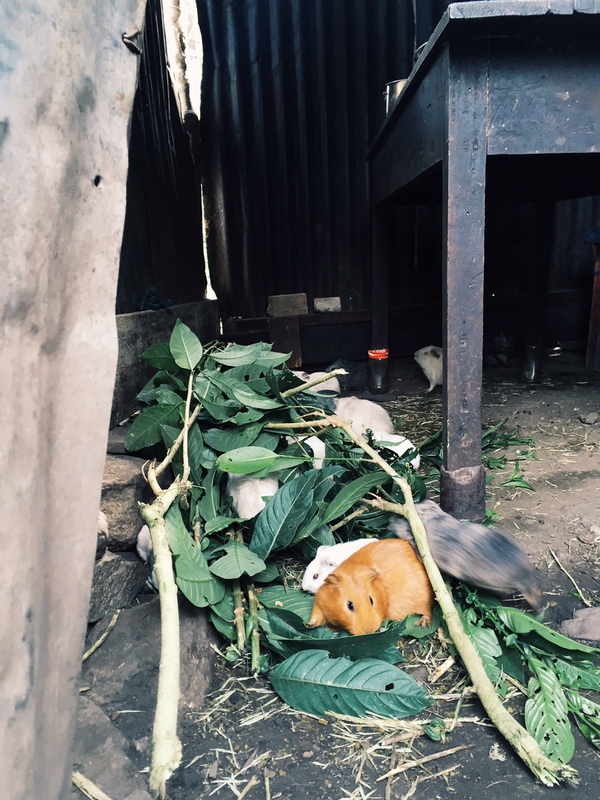 Junildina’s guinea pigs eating coffee leaves. 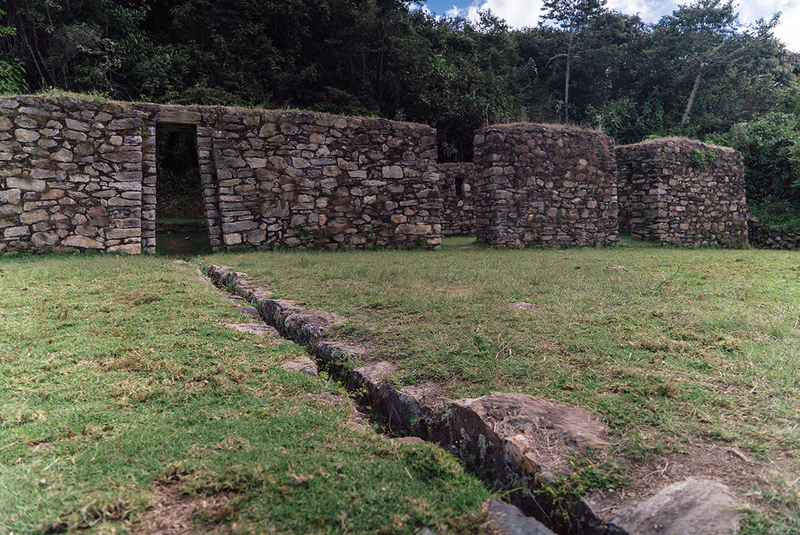 The coffee buzz gave us the energy we needed to push through the rest of the day to our campsite at Llactapata, an ancient Incan rest stop with some walls still standing. Across the valley, we got our first peek of Machu Picchu. 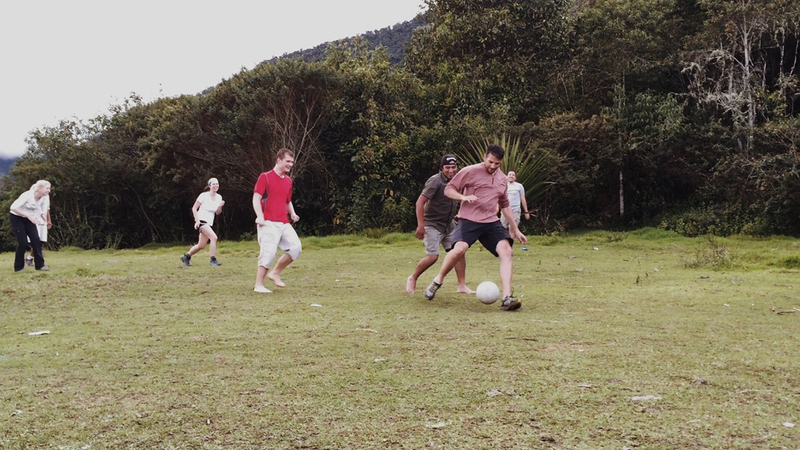 We arrived fairly early in the day, so after very cold showers and a snack, the camp enjoyed a game of futbol at 10,000 ft (Peru vs America… guess who won). Regular day on the trail. Our first peek of Machu Picchu, across the valley from Llactapata. 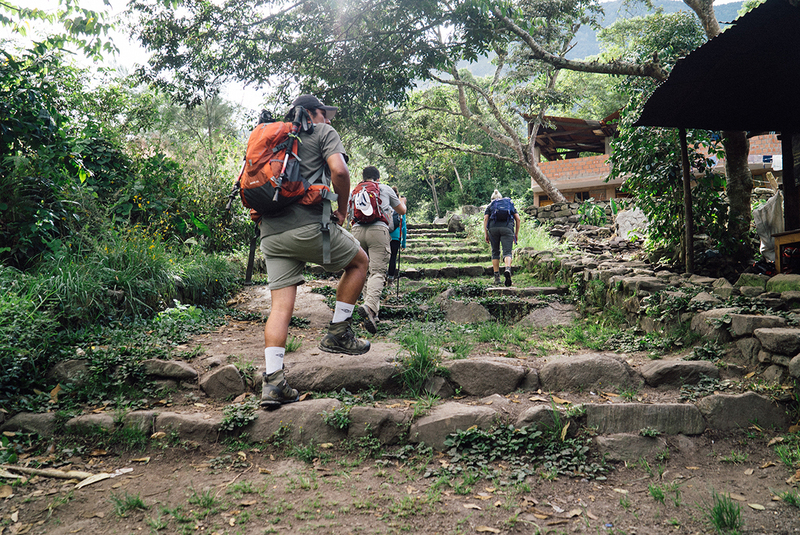 The final push to Aguas Calientes seemed like it should have been an easy day. First you go downhill from Llactapata to the river valley, then cross over the hydroelectric station before following the rail tracks into town. However it proved to be a challenge, again, in its own unique way. You’re fatigued from the previous days, and this day isn’t especially interesting compared to the previous days. You follow the tracks seemingly forever, and lots of loose rock makes it more stressful than leisurely. 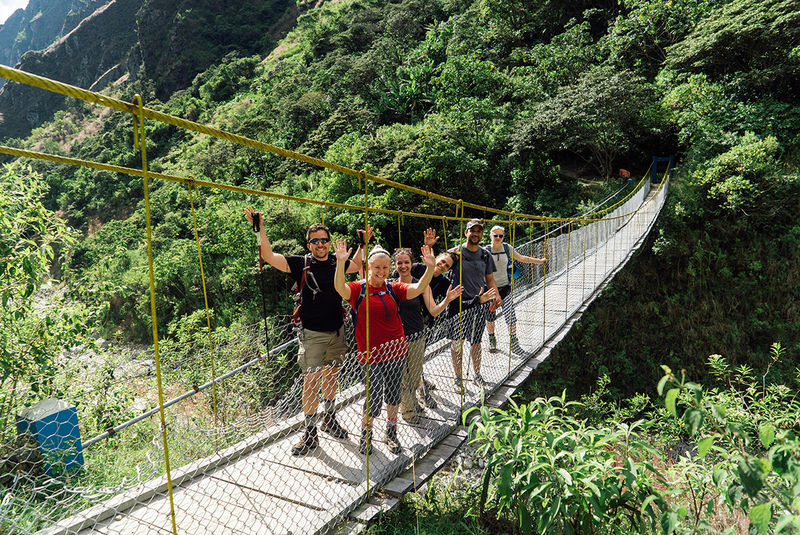 Crossing the long bridge over the Urubamba River. 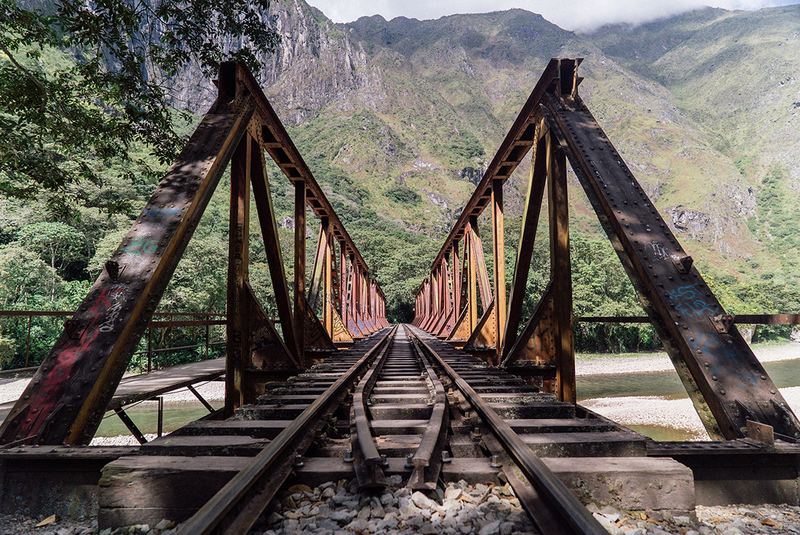 By the time we reached Aguas Calientes, we were hardened and filthy trekkers, giving dirty looks to the clean, wide eyed day-tripping tourists who were stepping off the luxury train. Tip: Aguas is a town on a hill, and after hiking for four days, we found out our room was on the very top floor of the hotel at the very top of the hill. 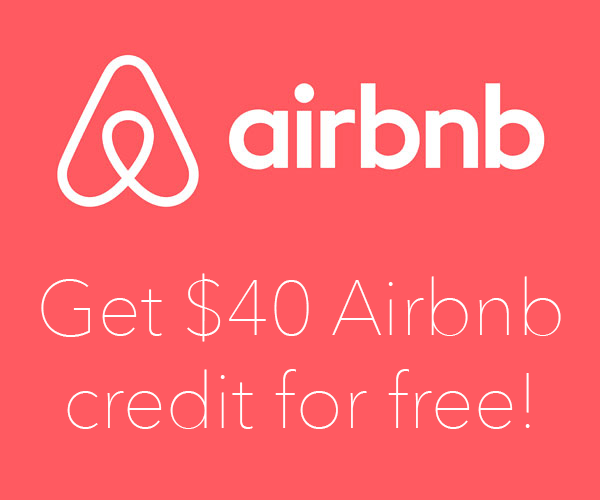 It’s sort of a minor complaint, more of a “You’ve got to be kidding me” kind of a deal, but you might want to look into your hotel location to be sure. Finally having a hot shower and getting a massage before dinner helped us get over it. 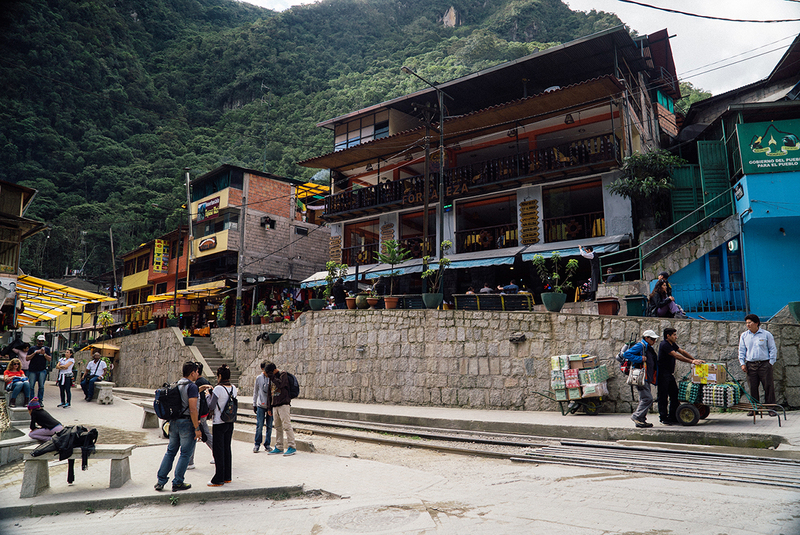 Aguas Calientes is a neat little town with lots of restaurants. The namesake hot water springs are also a good way to relax tired muscles. 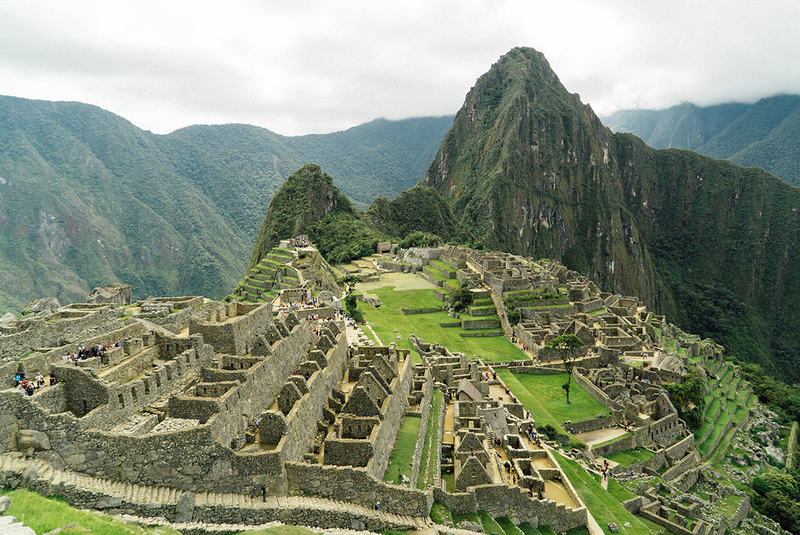 Finally, the moment has arrived, what you came to see: Machu Picchu. You awake early to catch a 5am bus up the mountain to the legendary Incan city. You’ll be shocked at how many other people are up early to catch the bus as well. But it all worked out and the wait was fairly minimal once the busses started running. If you’re lucky you’ll have a clear morning and see the sun coming up over the mountains. We had to wait a bit longer for the fog to lift. Given our luck with weather the rest of the trip, we weren’t too bothered by this, because when it cleared it was definitely a sight to behold. Ollantaytambo, Moray and dozens of other Incan sights are all very impressive, but Machu Picchu really does stand head and shoulders above them with its impressive layout and beautiful setting nestled between the peaks of Machu Picchu mountain and Huaynapicchu. 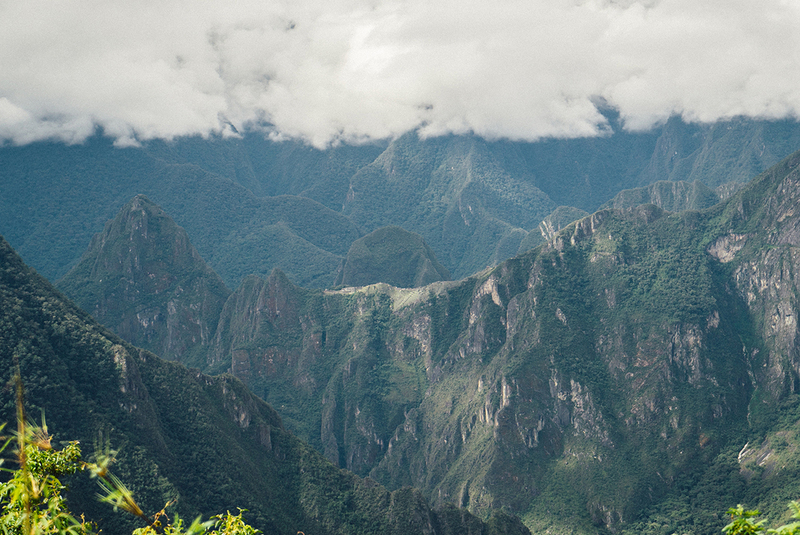 From this vantage at Machu Picchu, you can see the ruins of Llactapata across the valley, where we camped on the 3rd night. Staying in Aguas and being in the first group up the mountain meant enjoying Machu Picchu before the crowds of daytrippers arrived from Cusco, a definite perk to taking a trek to the Lost City. Christian guided us through the village, and at 10am left the two of us at the entrance to Huaynapicchu, the tall peak of the classic Machu Picchu photo. 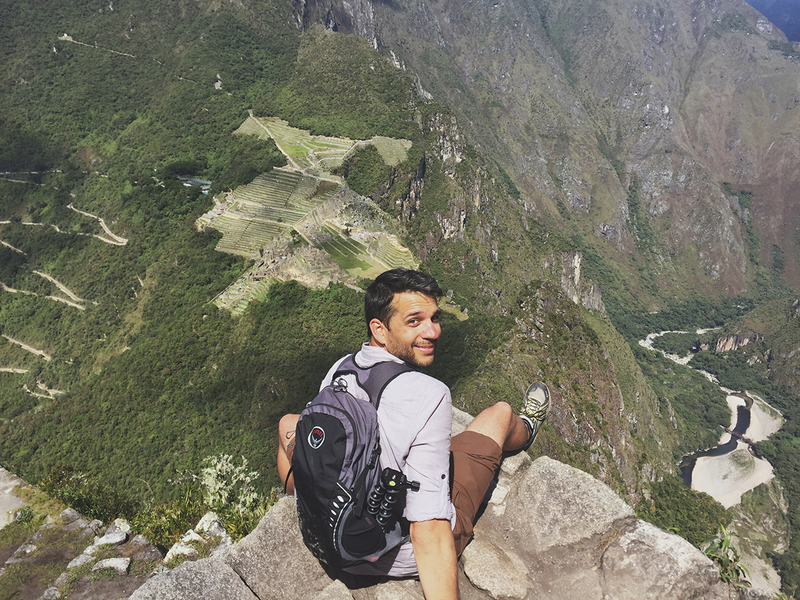 They only issue a limited number of tickets every day to climb Huaynapicchu so if you want to do this it’s advisable to book in advance through your trekking company. Even though we were dead tired and hungry (no eating allowed in Machu Picchu), we mustered up one last bit of strength to climb the peak. Let me just say, areas of this “trail” are so steep and treacherously slippery, that I’m afraid they will soon close this peak to visitors. It already requires a sign in and sign out to ensure visitors make it out safely. It was one last amazing adventure for us, and once we reached the top, the view of Machu Picchu city below was truly incredible. 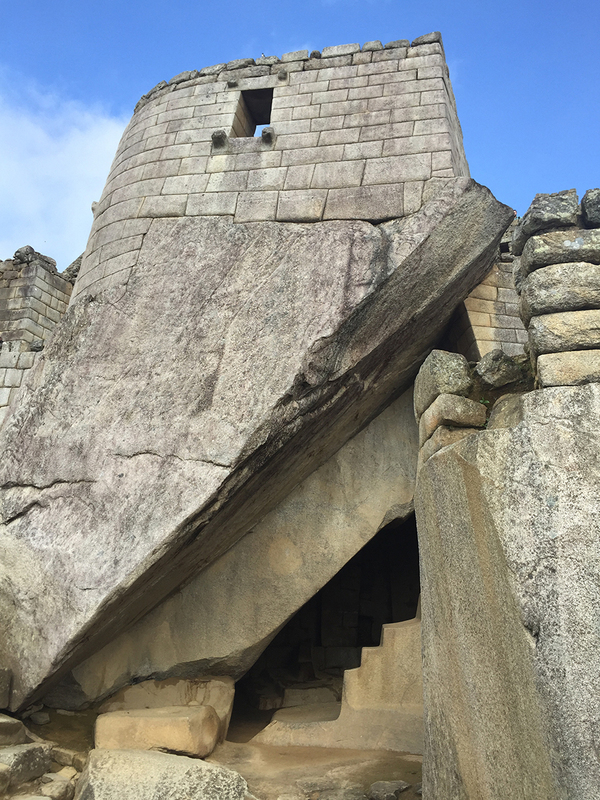 One the incredible temple structures at Machu Picchu. 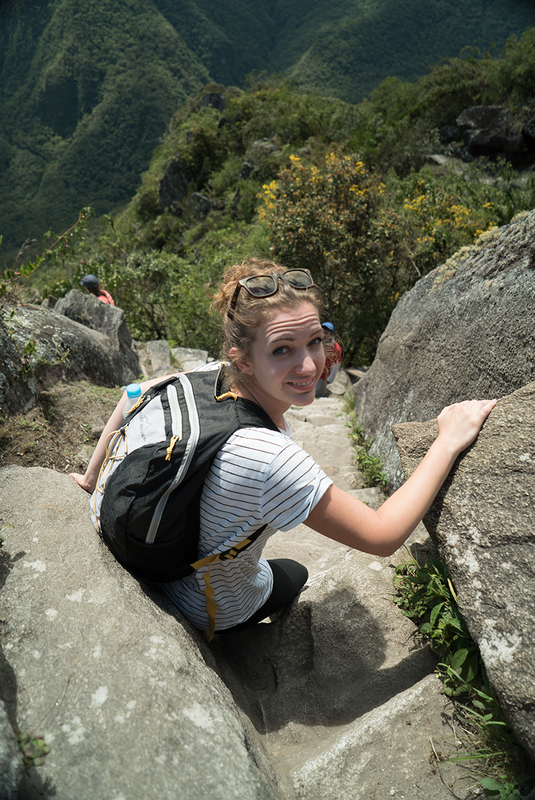 Really steep and slippery path down Huaynapicchu. At the top of Huaynapicchu mountain, looking over Machu Picchu. Getting back to Cusco is done by train, and you have the option to upgrade to the “Vistadome” train which has windows in the ceiling to give you a better look at the scenery during your three hour trip. If you’re daytripping to Machu Picchu from Cusco, this is a great option to take in the landscape. For two exhausted hikers who had been living the landscape for the past few days, it turned out to be not worth the extra money, because we slept the whole train ride. Back in Cusco our group rejoined for one last farewell dinner, feeling more like old friends than the strangers we were four days prior. One week is never long enough to truly get to know a place, and we hate leaving feeling like we’re just passing tourists, but we’re honored to have been so warmly received by the Cusqueñans and Quechua people, and are very satisfied with the experience we had in the Sacred Valley. 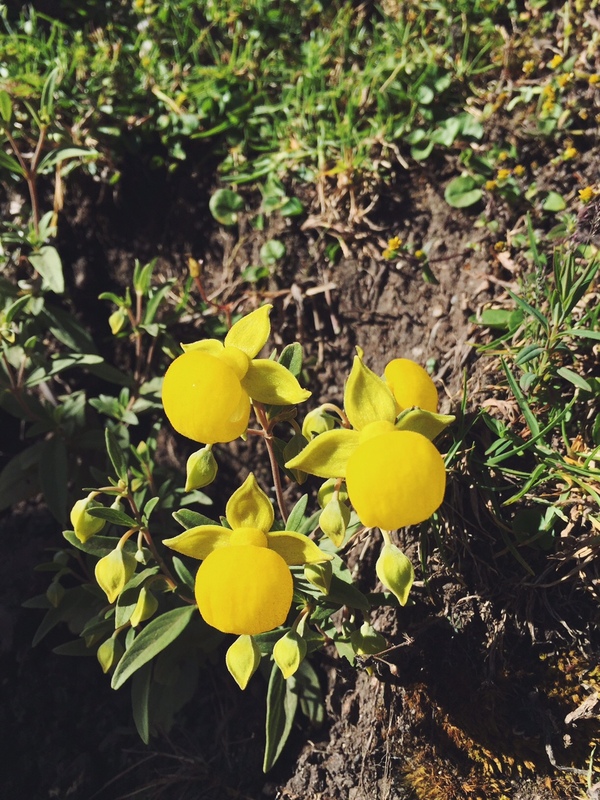 If you’re thinking of taking the Salkantay trek, but you’re a beginner and not sure you’re up to it, my suggestion would be to go on a short hike every weekend for a month and see how you feel. 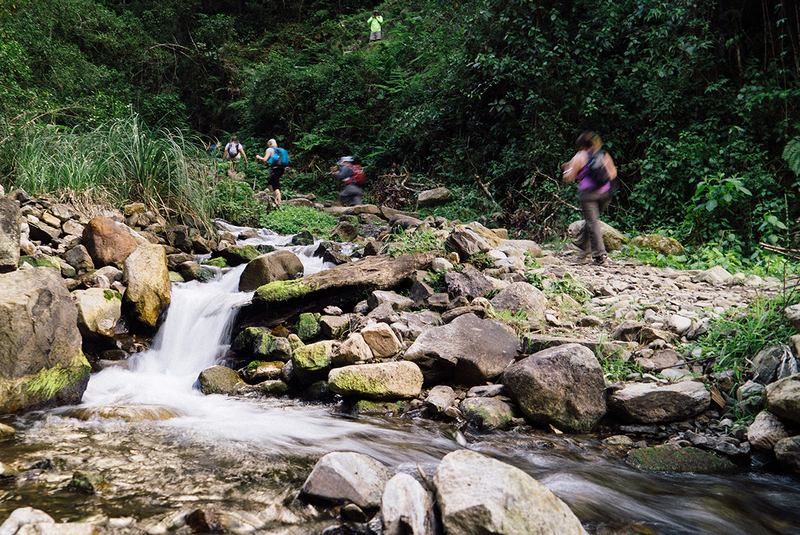 Then go for a long, 5-6 hour hike to test your endurance. 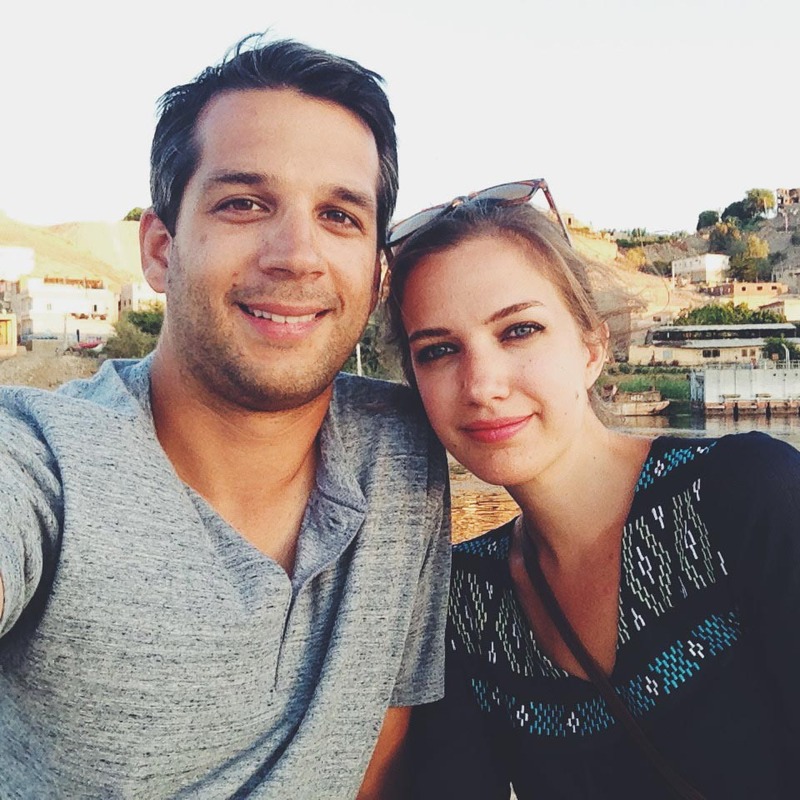 Neither of us are in poor physical condition, but we do sit in an office for eight hours a day, so we really weren’t sure how we would hold up. It’s amazing what a little training and willpower will do for you! WOW!! Great pics, and we’ll written! Unfortunately in order to truly understand and appreciate the experience, one must do the trip. Thanks for sharing. Was a pleasure traveling with the two of you. Amazing pics!!! also amazing to met both of you in this incredible trek! Hope to see u in Buenos Aires one day!! 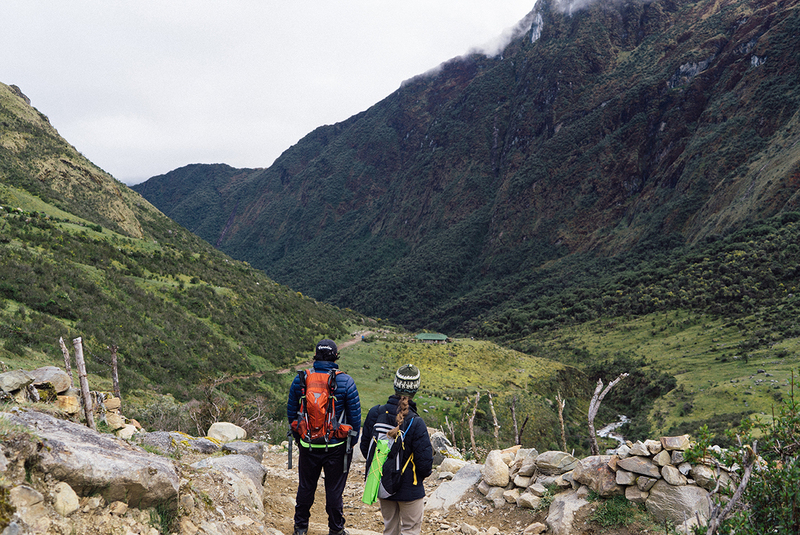 This is a great review about Salkantay trek, thank you for share your experiences so many other travellers will take as a option to go Machupicchu in an alternative way through amazing landscapes around the white Andean mountains. Thanks! You have a beautiful country, we would love to return someday and stay longer. One week was not enough! Really enjoy your journalistic style! Thanks for all the info- I’ve been reading absolutely everything I can as we’re going in August and I’m nervous that I’m not fit enough! Your writing gives a great balance of realistic and splendour! We were worried too, but going for 2-3 hour hikes on the weekends leading up to our trip helped! You will have a great time! Great photos! We also did the Salkantay Trek with Alpaca and loved it! One of my best friends, his girlfriend, my brother and me booked the 4-day Salkantay trek and started with an open mind. We had a fantastic time: breathtaking views combined with breathtaking hikes. Walking everyday was great exercise, the route took us from high mountain passes to wide open planes and rainforests, ending with an almost deserted Machu Picchu on the last day. Well, at least the first hour or so 🙂 Our guides were ready to answer all of our questions – and we had a lot. 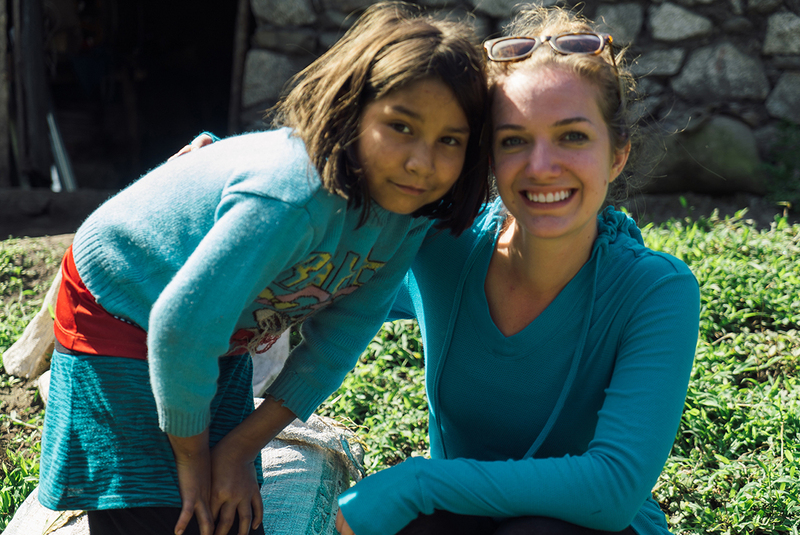 Apart from a fantastic trip, the people at Salkantay Trek organization were very friendly, always quick to respond, and offering solutions to our complicated requests. I would certainly recommend this trek to fellow travellers. Thanks for sharing Jan! Glad you had as great an experience as we did. Hi there! I really enjoyed your post, and my boyfriend and I have decided to use Alpaca in part due to your review. We’re doing the 5D trek as well, and were curious what size backpacks you used. I want to make sure we can fit everything without having an excessive bag, since their porters help carry your luggage. Thanks so much! Hi Jacquie! You’re going to have a blast with Alpaca as your guide. Check out our packing list post with what we took on the trek for details about the gear and essentials you’ll need. Happy travels! When you crave adventure like most people crave chocolate, you keep your eyes open for opportunities to feed those cravings. 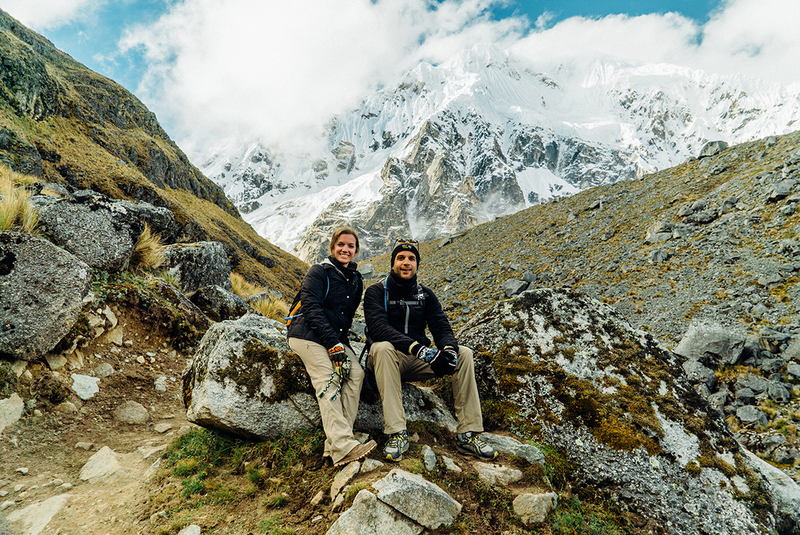 So when a friend asks if you want to tag along to visit their friends in Peru and check out Machu Picchu, you say “Heck, Yes!” While Peru has a lot of great adventure opportunities, the Salkantay trek to Machu Picchu is one worth checking out. It is good to be prepared, but the Salkantay Trek itself is something that you should go into with almost no idea what you are going to see, so yeah, I’m not going to tell you anything about the actual trek. It’s like finding out Darth Vader was Luke’s father before you got to see it yourself. 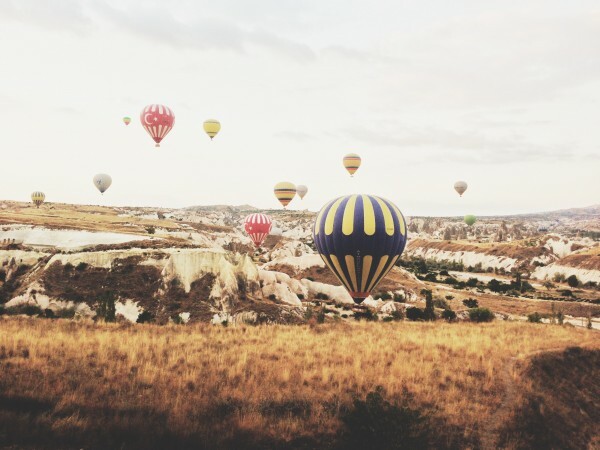 Prepare your sense of wonder for some of the most incredible five days of your life. 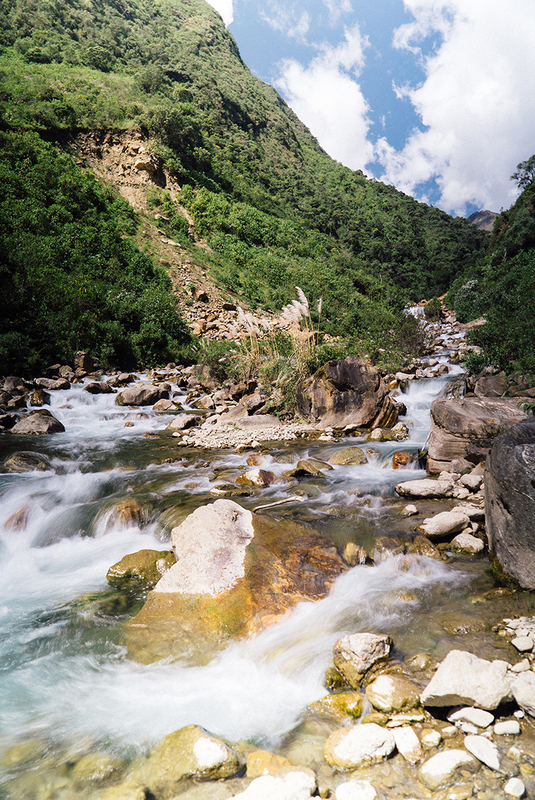 Go ang experience this trek with…..